Eva Xu poses for a photo as her mom, Michelle Chen, talks with Shari Harmon, RN, in the background. Five-year-old Eva Xu’s mother called her daughter’s cancer diagnosis a ‘blessing in disguise’ for how it brought their family closer and exposed an inner strength they didn’t realize they had. “Even though it’s a horrible thing, it all depends on how you look at it,” said Eva’s mother, Michelle Chen of Youngstown. “We’ve grown so much closer as a family. We learned not to complain and not to ask questions, but to be thankful she’s still alive. The Xu family’s life literally changed overnight in November 2016 while Chen and her husband, Barry Xu, were away on a business trip. Barry’s mother was watching their children, Eva, then 4, and Jaden, then 9. Eva couldn’t lift her arms more than a 90-degree angle, and later that night she developed a fever. “As a mother I knew something wasn’t right,” Chen said. Eva was then taken to the ER on the Akron Children’s Beeghly campus. 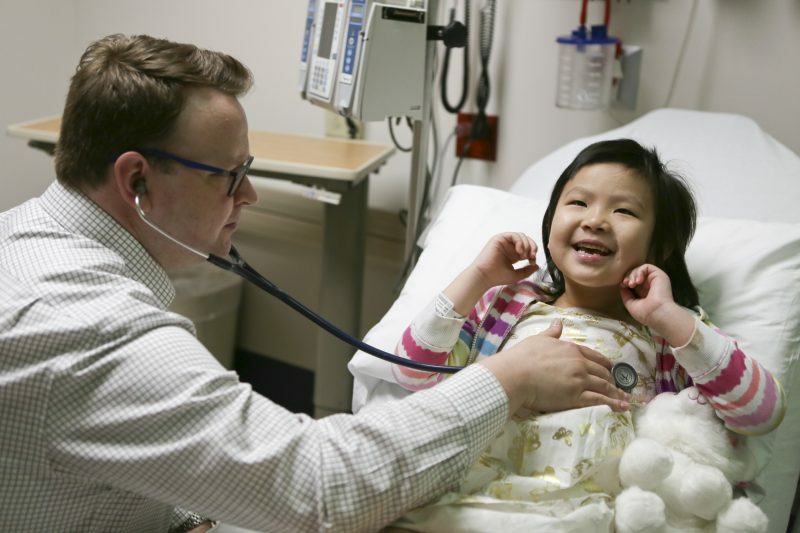 When blood test results came back, she was rushed to the Akron campus where a team of doctors was awaiting their arrival around 3 a.m.
Eva was all giggles as Dr. Daniel Pettee examined her. 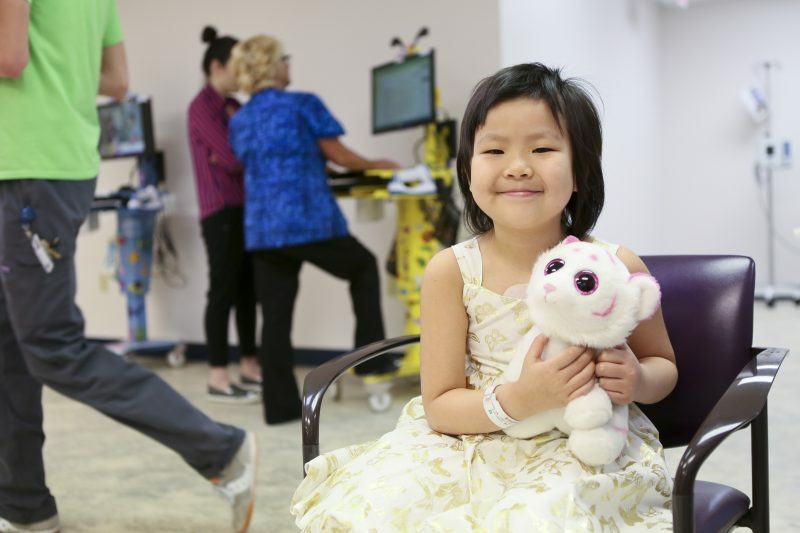 Dr. John Fargo, pediatric oncologist, pulled Chen aside and told her they suspected leukemia, so they scheduled a biopsy. In the morning a bone marrow test confirmed the diagnosis, and Eva immediately started chemotherapy treatment. She spent the next 8 days undergoing intense treatment, and by the 6th day test results showed she had a low-risk type of leukemia; one with a 95% success rate. While Eva is in the middle of a 2-year, 3-month treatment cycle, she’s officially in remission now. After 27 days the cancer cells were completely gone.